This is the second of our Race to Alaska updates. 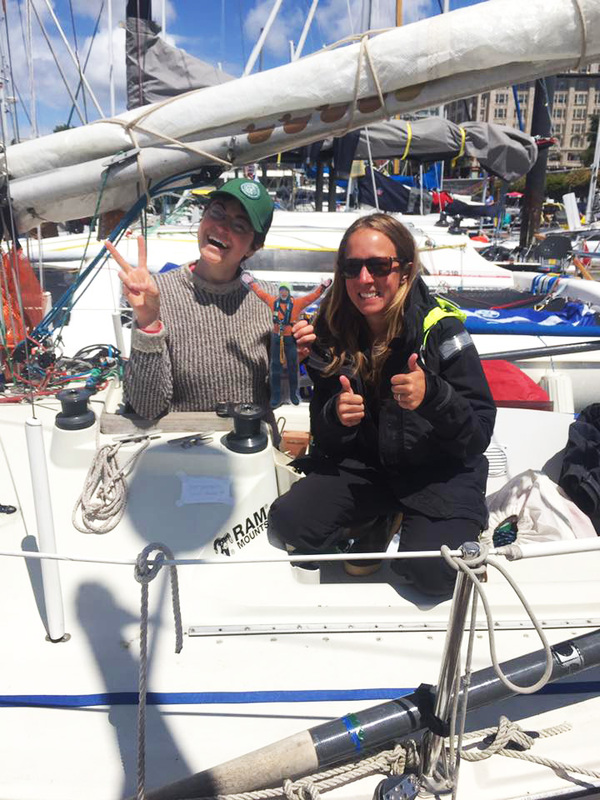 Don’t miss our first report, with some great stories of teams caught out in a Juan de Fuca gale. As we come to a close on the third day since the R2AK restarted in Victoria, we have a much better picture of how the race is shaping up. Three race favorites – Team Freeburd/Pure & Wild, Bad Kitty, and Big Broderna – are many miles ahead, with the Burd brothers presently maintaining the lead they’ve held since the first day. They’re making quick work of Johnstone Strait in what has been a comparatively mellow transit of notoriously windy waters, and are approaching Port Hardy at the time of this writing. I’ll take a moment here to take my hat off to Team Pear Shaped Racing, who have retired from the race. A confluence of factors including a collision with a log and a hypothermic captain made this the right call. They were, however, leading at the time they had to turn for port. Good on you for pushing hard and making good decisions, Pear Shaped. I hope we see you in the R2AK in the future! Back to those still on the course, two other boats are through Seymour Narrows, 3 1/2 Aussies made it through against several knots of building adverse current on an F-31R trimaran, while Team Ketch Me If You Can flew through on the next tide gate doing 10 knots with the spinnaker up on their Nacra 20. Further down the course, seven boats are in the vicinity of Campbell River, it now looks like Discovery and West Coast Wild Ones will make it interesting by pushing to get through Seymour Narrows this evening. Another eleven boats are still underway in the middle of Georgia Strait between Texada Island and Comox, while nine others are flanking the Vancouver Island shoreline between Nanaimo and Qualicum Bay. We’ve had the good fortune to hear directly from two teams today, Team Global and Team KELP, and we’ll share an update from the race leaders that you may or may not have seen. Team Global off of Lasqueti Island today. The gregarious quartet that make up Team Global had checked in with me a couple of times since the race got restarted in Victoria, and this afternoon we got to have a lengthy phone call. A look at the tracker indicates that things haven’t gone 100% to plan, but they’re still in good spirits and are definitely good-humored R2AKers. As far as the sailing, they had generally chosen to spend more time out in the Georgia Strait than some of their competition, a choice that Katy said, “may or may not have been a very good one.” They didn’t go into the Gulf Islands at all, after seeing predictions for more wind in Georgia Strait. It didn’t turn out that way. “Go out in to Georgia Strait they said… there’ll be wind out there they said…” It seems they’ve just been in the wrong place at the wrong time, a situation any sailor, certainly any racer, has experienced before. When I spoke to them today, they were just off the west side of Lasqueti Island, sailing at about 2 knots in 5-8 knots of breeze. Captain Katy had just woken up and offered in a good-natured tone, “Every time I go to sleep we don’t make any progress. I mean come on!” Elan retorted that she has a special ability to pick the no wind times to go off watch. It was just on the border line of pedaling vs sailing, but they were relying on sail power at that moment. So it was very light? Well… sort of. It was very light, except when the breeze came up so strongly that they had to tuck in a double reef and go back and forth in adverse current over the same ground they’d bobbed up and down over in the light stuff. Sounds frustrating to me. Ultimately, I think they’re feeling that the weight of the boat is affecting them more than they had anticipated. Katy said, “To see everybody shoot up with the southerlies, that’s not good for morale or ego.” It hasn’t been easy to stomach the sight of lighter boats ghosting past them, which has happened on more than one occasion. I told them I was sorry it wasn’t all roses. They said it has been, just some really smelly roses! Don’t sleep on this savvy team, though. As they get to know their boat better and better, things may look different. And, once they get through Seymour Narrows, it’s fair to expect a big chunk of upwind sailing in Johnstone Strait, which is exactly the conditions they chose the boat for. Go Global, go! Team KELP in Victoria before the start of the leg to Ketchikan. If you think they’re doing well, you’re right. 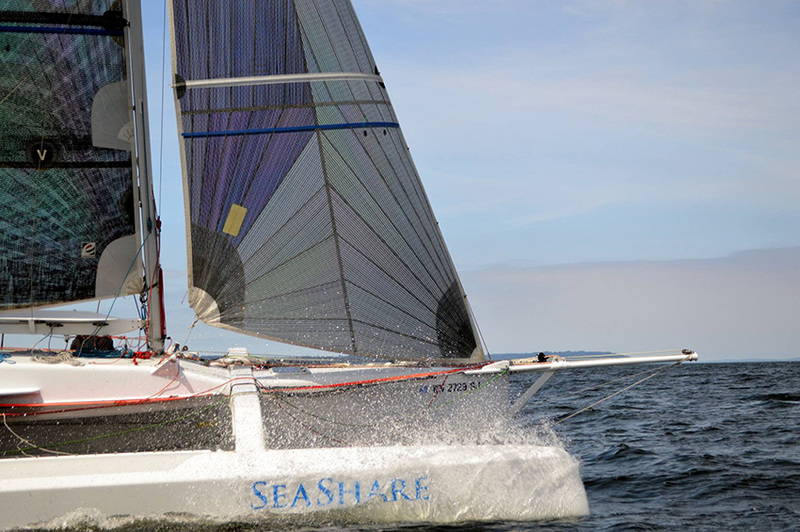 For a team that downplayed the “race” part of Race to Alaska, they seem to be pushing hard and sailing fast. Even they’re surprised, saying, “We did NOT think we’d be aiming for Campbell River on the third day. We thought 50 miles would be our top for any day.” They’re hoping to get into Campbell River sometime between midnight and 3:00am. In addition to some great navigational choices, the reason KELP might nearly double their expected mileage max-out is because of breeze and seas from behind. That doesn’t mean that it’s all be awesome and comfortable, however. They described the motion of the boat as, “really rolly polly – torquing like the waves were wringing out a washcloth (us).” In fact, when I noted that morale must be very high, Elena said, “It is, but I did barf this morning.” The breeze was heavier earlier in the day, and the rollers were there right away, making the stout little Santana 20 yaw and pitch. “I was really tired and Kristin handed me an egg, and my body was like, ‘NO! '” She had to admit, though, that she felt a lot better after she’d gotten seasick. The breeze got lighter in the middle of the day, and they got to sail under spinnaker for much of the day. When they called around 4:30pm this afternoon, it was building again and they had just took spinnaker down. 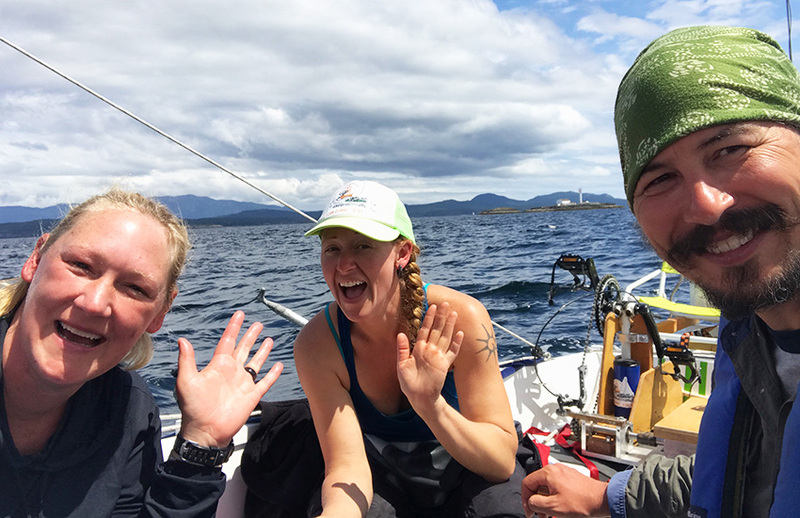 Team Freeburd/Pure & Wild in Johnstone Strait. We can see the end of Johnstone Straits about 10 miles ahead. We are still making good speed, but the breeze has died to about 4-5 knots. We are being chased by BAD KITTY and BRODERNA who both made it through Seymour last night. We had an extremely exciting and memorable passage through Seymour Narrows last night in the darkest of dark you can imagine and nearly max current. About Campbell River the current started building in a fading breeze. The current was so strong we were tacking through only 30 degrees. As we approached the Narrows, Chris and I remembered our passage two years ago and we began to get fully prepared- hatch boards in, Ocean Rodeo suits, Deckvests, Headlamps and safety gear all on. We hoped we were prepared for whatever might come. Soon the only wind was the apparent wind caused by the current moving us at a peak speed of 12 knots! We barely had any steerage and we were being pushed and pulled around by the current and eddys. As we entered the gut of the Narrows we could hear but not see breaking waves all around us. Here we go, we thought! We were most amazed to find it was not waves at all, but a huge school of 30-40 porpoises travelling with us. Our passage proved to be thankfully uneventful other than this incredible experience. The porpoises followed us and frolicked in our bow waves for the next 10 miles, tacking with us. It was so incredible. We were sad to see them go. We had a couple close passes with a cruise ship and a barge and were thankful to have such good headlamps, a handheld torch and AIS. Thank you PrincetonTec. Sailing through most of Johnstone Strait was generally upwind, with 15-20 knots. It was pleasant sail with a reefed main and J1. We have a long way left to race, the boat is all good and we are having an amazing time. Trevor’s eyes are wide open!